This year, if all goes according to plan, St. Timothy Roman Catholic Church in Union, Ky., will break ground for an elementary school that will provide a parochial school education for hundreds of local children. It would be the first time a parish in the Diocese of Covington , which oversees 14 counties in Northern Kentucky, has started an elementary school in half a century. According to Tim Fitzgerald, the diocese’s spokesman, the last time it happened was in the 1960s. Immaculate Heart of Mary Parish in Burlington built its first school building in 1962, he said, and Mary Queen of Heaven in Erlanger and St. Pius X in Edgewood probably built theirs in the ’60s as well. In recent years, parishes on both sides of the Ohio River have focused more on closing schools that can’t support themselves and consolidating them with other schools. The most recent parish school to open in the Archdiocese of Cincinnati was St. Mary in Hillsboro in 2000, archdiocese spokesman Dan Andriacco said. Non-parish Catholic schools that have opened within the past 15 years in the archdiocese include St. Peter and Paul Academy in Reading and Mother Teresa Catholic Elementary School in Middletown, both started by parents, Andriacco said. The Sisters of Charity opened DePaul Cristo Re High School in Clifton one grade at a time, Andriacco said, and the school graduated its first class last year. St Timothy parishioners have talked about building a parish school since the parish opened in 1989, said its pastor, Father Rick Bolte. The parish finally decided to move forward with fund-raising for the project in 2014, he said, after commissioning a feasibility report from Cincinnati-based fundraising counselors The Yunker Group . Unlike urban parishes that are losing parishioners, St. Timothy is in a rapidly growing area, and the parish has grown along with it, from 200 families in 1989 to about 1,600 now, Bolte said. There is a waiting list for the parish’s preschool, which has about 180 students and begins offering full-time kindergarten this fall. Father Rick Bolte, pastor of St. Timothy Roman Catholic Church in Union, Ky., stands at the cross beside the church sanctuary surrounded by students at the church preschool, many of whom will likely attend the new Catholic school the church plans to build. 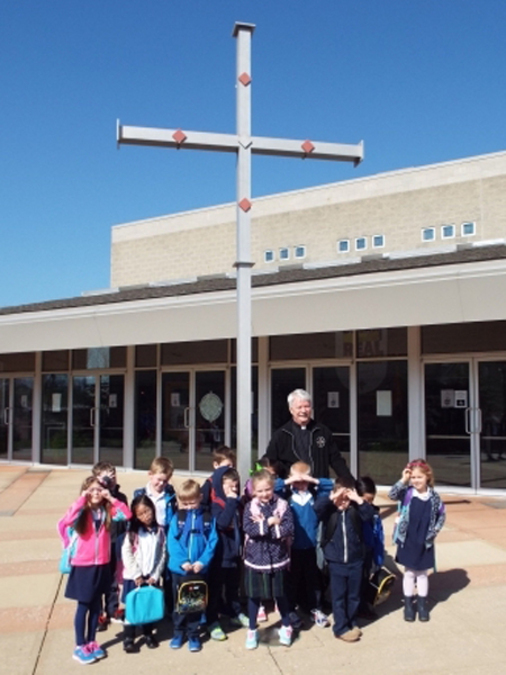 The parish plans to offer first-grade classes next fall in its parish center, which now houses the preschool, Bolte said, and slots for those classes filled up in two days. Pending Boone County Fiscal Court approval of its site plan, St. Timothy hopes to break ground for the school building, on a hill behind the parish center and sanctuary, in May, and to open the school in the fall of 2017. It has raised $5.6 million in pledges, Bolte said, which is enough to build a set of classrooms for each grade and possibly a gym. He doesn’t know how many staff members will be needed — that will depend on how many students are signed up. He expected that tuition, the main source of funding for the school, would be comparable to the diocese average of $5,300 annually. You could say that to make a parochial school education availalbe to children is one way to ensure they remain practicing Catholics. According to the Washington, D.C.-based Center for Applied Research in the Apostolate, a nonprofit that does social science research about the Catholic Church, Catholics who attend a Catholic school are more likely to attend Mass more frequently than those who did not. That’s especially true of younger Catholics and members of the millennial generation, most of whom didn’t attend Catholic school and only 5 percent of whom attend Mass every week. Gray also attributes a decline in the number of confirmations celebrated in the United States to a lack of Catholic schooling. Two-thirds of millennial Catholics who never attend Catholic school are confirmed, as opposed to 82 percent of those who attend a Catholic primary school and 91 percent who attend a Catholic high school. CARA’s surveys of the nation’s adult Catholic population show that fewer Catholics are getting a Catholic education. In those surveys, 51 percent of adults born from 1943 to 1960 say they attended a Catholic primary school. But only 23 percent of those born after 1982 say they attended a Catholic primary school at some point. St. Timothy has an excellent Parish School of Religion program, in which 600 parishioners who attend public schools learn about their faith, Bolte said. As good as it is, he said, it’s only one hour per week after school, and no one could say it is as good as having them attend a Catholic school. “If you believe in Catholic education and the Catholic school, it’s hard to say we shouldn’t have the school here,” Bolte said.